Your story begins just like your brothers before you. Long before your arrival. Growing up I always said I wanted 4 children but when your Dad and I were talking about kids we always thought we’d only have 3 but, when I was pregnant with O we both knew from the very beginning that we wanted more. That we wanted a bigger family. So here we are. The funny thing is before we were trying I saw a psychic, which is weird because I don’t believe in that sort of thing, but she told me that my next baby would be a girl. But, she went on to say that she saw a 5th child and I would ultimately have 4 boys and 1 girl. I laughed but she kept reiterating she saw a 5th baby but the next one would be a girl and it freaked me out just a little even though psychics aren’t my thing. The week leading up to finding out I was indeed pregnant I just had a feeling we were going to see a positive test. I just knew. I had my usual early pregnancy symptoms. The onslaught of hot flashes and all that. Even one day in the middle of the wait your Dad randomly turned to me and told me I was glowing. I could hardly contain my excitement at that point and worried I was setting myself up for big disappointment. So on March 27th, 2015, the second your Dad left for work I ran to the bathroom to take a test. It was 7:43am when I saw a second pink line appear. I was over the moon and since you were going to be our last baby I felt I had to come up with a special way to tell him. I tried googling ideas and there were a few I was considering: due date cookies, a poem/note, putting your due date into our shared calendar, photos of shoes, been there done that now it’s my turn signs with the boys, ice cream cake with the due date on it, pink and blue balloons on the house, colouring he & she on a Hershey bar, etc. I just didn’t have time to do much after naptime and running around to get E at preschool and of course it was the day your Dad said he was going to be coming home early. That put me into panic mode. I decided to write a cheesy note and put it on his plate on the bottom of the stack on the table. The note said: “Roses are RED, Violets are BLUE, on DECEMBER 9th, our next baby is due! I love you!” He passed out the plates and didn’t even see it sitting in front of him. He kept goofing around with O and making faces and it was a full 2.5min before he finally reached to get his donair and looked down. He read it. He was so excited and happy and said “really! ?” and he welled up and told me I was a boog and to turn the camera off. We couldn’t wait to meet you and to complete our family. This marks the beginning of your story. The first calls and messages I sent were to our doula, the local Genetics Counselor, and our family Dr to give me the referral to Dr. G and for an ultrasound for dating for all my genetic testing. Within days I had a referral and my first appointment with Dr. G was going to be on May 27th when I was exactly 12w and my first ultrasound was scheduled for May 11th when I would be 9w5d. But, turns out the genetic counselor wanted the dating ultrasound done earlier so things could be scheduled so she moved the ultrasound to April 30th when I would be 8w1d. I couldn’t wait to see you but I couldn’t wait to see if you were ok in there so I used the doppler earlier than I ever had before knowing I would probably hear nothing but with the scan coming up I wanted to try. So on April 25th when I was just 7w3d I took out the doppler and it was a minute or so and I couldn’t find a thing other than my own artery. Not even a placental sound so I admit I was worrying because I thought we would at least find that. Your Dad tried and nada. He caught the placental sound once midline so I breathed a sigh of relief. Then I found it again. Then we heard a blip and we both thought it was the fastest glimpse of a heartbeat. I was about to shut the doppler off, happy to have found the placental pulse, when all of a sudden I heard the all too familiar train sound. OMG! A HEARTBEAT! Your heart was beating and we could hear it plain as day! I got your Dad to grab the phone and take a few videos since I was too afraid to move and lose it. I got a couple pretty clear videos. The doppler wasn’t reading right because it kept hiding behind the slow placental sound but your Dad counted it to be at least 160bpm. We were so happy. So on April 30th, your Dad and I went to the ultrasound clinic and were so excited to be seeing you. We set up a system for him to squeeze my hand when he saw baby and heartbeat since I knew I wasn’t going to be able to see the screen in case the tech didn’t say anything immediately like usual. Wouldn’t you know I had a quiet tech who took forever and when I didn’t feel your Dad squeeze my hand (he said he did and I just didn’t notice) I began to feel panic. But, she finally turned the screen and pointed things out and gave me measurements and a heart rate and I was so happy! Turns out they were dating me 3 days ahead but I didn’t care, we were so elated. A few weeks later we started telling people since my belly had ballooned up and people local to us may start wondering. I was big for the gestation, exhausted, suffering from acne and not drinking so I wanted to be sure to tell everyone before rumours started. 😉 I did up a photo collage with your brothers holding photos of their big brother announcement shirts and O wearing his with a sign beside him that read “Now I’ve Got a T-Shirt! Being promoted December 2015”! Everyone was so happy and excited for us and you. It was a relief because I was worried there might be some negativity with a 4th child so close to the others but I worried over nothing. I knew I was going to have a lot of appointments and trips to Calgary and ultrasounds just like every other time but there was nothing new there. I wasn’t as on edge with worry as I was when I was pregnant with O but I did feel more apprehension around the amnio this time for some reason. All the ultrasounds in town, at the OBs office, and in Calgary showed you measuring 3 days ahead giving a date of December 6th, 2015 which became my EDD but I just planned to use both dates to my advantage. If I went early those 3 days might keep me out of NICU and if I go “late” they would buy me a few before induction but I didn’t think that would be a worry any way with my history of early labours. The next big obstacle came June 18th and it was amnio day. And boy was I nervous. I’m sure I drove your Dad crazy with needing reassurance and talking things out but deep down I knew all would be ok and I had to do this so I would be as comfortable as I could be and wouldn’t get the “surprise” I got with N. After all the preliminary papers were done and the scan I was sent to wait in what I describe as a paper crop top. I was trying to make the situation light and your Dad and I were quietly laughing through the nerves at my ridiculous outfit and we waited. Finally I was called in for the procedure. The Doctor looked around for the best place to enter and she turned to me and said it was probably going to be more uncomfortable because she has to enter so low in the uterus. Truer words could not have been spoken. It hurt. It wasn’t like my first one with O. I didn’t look at the screen I just buried my head into your Dads arm and breathed through it but as soon as the needle went in your little hand went for it and you could see your 4 little fingers as clear as day. I didn’t even want to turn to look at screen but the Dr. and tech excitedly told your Dad to get his camera and take a photo so he did. The Dr. went on with the procedure and told me that I’m stoic and then said “this is how labour is for you I bet” and your Dad said “pretty much. She’s a rockstar and a labouring machine”. I giggled. It lightened the mood and then it was all over. Now we could get cleaned up and head home to wait. I didn’t have to wait long to get the initial results. I had an unknown number call me on Monday and I debated not answering it because I hate talking on the phone, especially to telemarketers. I was surprised it was MFM already. They told me all chromosomes were there and accounted for and it would be a few more weeks before getting the CHARGE results back. After a few hiccups and weeks and weeks later we got word from Sick Kids that the familial mutation was not present. I could breathe a sigh of relief and not have to worry about needing to deliver in Calgary. As the pregnancy was getting closer to being over I was constantly taking videos and photos of my belly and all your movement since you are the Caboose to our family and I love being pregnant and this would be the last time. I passed all BPPs, NSTs and was eagerly awaiting your arrival. I quickly and easily passed the 36w date of N, the 37w1d date of E and the 38w3d date of O and then I was getting antsy. I really thought you would be here by the first of December but you had other plans. Of course. Carli came down for a week to hopefully time it right for child care but you m’dear had other plans. Carli’s visit was awesome but it came and went and you gave me no signs of being ready any time soon. I knew I was running out of time before the Doctors would be pushing induction because of my Diabetes and insulin requirements but you were comfortable and wouldn’t you know it, Dr. G was away on holidays after my 37w appointment and wouldn’t be back for 3 weeks. That made me nervous because he was so calming and didn’t seem like he was going to push induction “just because” but I knew that was the last time I’d see him because I knew I wouldn’t be there past 40w. It made me sad and wouldn’t you know it, on what turned out to be my last appointment on December 3 I saw Dr. P, who delivered N, and he had induction papers ready for me. I felt so defeated. I didn’t get a great feeling from him and he was actually quite abrupt and rude and it was the first time in any pregnancy I cried because of the way he made me feel. He kept talking about a c-section and induction and told me he’d tie my tubes because it’s easier than my husband going through the snip. I was not impressed. Then he said he was going to do an internal exam but I knocked that down and I guess he planned to do a stretch and sweep but it never came to that since I didn’t want it done. It would tell me nothing and I felt confident that my body knew what it was doing but he didn’t have the confidence in me that I did. But either way, it was an emotional appointment and I fought back tears all through the NST that followed that meeting. My BP was up, obviously because of how stressed and emotional I was, but you did as you should on the test for the most part so I was just told to come back on the weekend for another NST to check on you and my BP since I was so close to the end. After that appointment I walked out and called your Dad and said it was time to start acupuncture for induction and I was scheduled in for the next day, which was Friday the 4th. That appointment was so relaxing. She put needles in all the important points, did some accupressure and massage after and told me that if anything would happen it would be between 6-48h and to make an appointment for Monday and if I didn’t show up she’d know that the appointment worked and not to worry about calling. After the appointment I went home and had a big chat with you while relaxing in the tub and just hoped it would work. The following day (Saturday) I went in for my NST and I had the nicest nurse. You passed the NST with flying colours and my BP was perfect. We had a great chat about induction and who would be on call on Tuesday and my worry about child care during labour. I told her that ideally this baby had to come on the weekend because after Sunday I have no one to look after my boys, and especially on Tuesday for an induction that I didn’t have care for that. She gave me the number of someone to call and offered to do a S&S to hopefully move things along. I debated it but turned it down because if my body wasn’t ready, it wasn’t ready and I’d continue walking and bouncing on my ball and praying you’d decide to come on your own terms. That night your Dad made me a pineapple core and mango smoothie as a last ditch effort to coax you into coming. I swear I tried it all (not castor oil though) and I didn’t think it would work but hoped it would and it tasted pretty awesome so I drank it and went to bed. Well wouldn’t you know it, E was up on and off all night wanting to get up for the day and finally at 5:47am we had enough and let him up for the day. It was then when I realized that my stomach was rock hard and I just felt like today was going to be the day. I turned to your Dad and told him my spidey senses were tingling. Then I went and messaged our Doula to let her know that I felt like things might be happening today. I then went onto FB to complain about the early wake up and to kill some time before having to get out of bed and the other boys were awake while I waited for you to decide to make your appearance. After enough of that I got your Dad to bring up my exercise ball so I could start to bounce to encourage something to start and he got our bags the rest of the way packed and showered and got the boys breakfast. I didn’t move from the ball other than to go to the bathroom and just kept bouncing away praying for you to make your entrance earthside. Your brothers were in and out to keep me company and they really wanted to bounce on the ball with me but with my belly there really wasn’t enough room. We were just killing time until it was a decent hour to message people to let them know things might be happening today and to see if we could count on them to look after the boys if/when we needed it. It seems everyone got to sleep in on that fine Sunday morning but us and around 9-9:30 we finally started getting responses and people letting us know when they were free if need be. 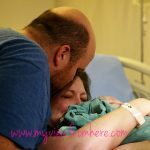 It was during that time we heard back from Doula as well and told her I was getting a random crampy feeling but no contractions yet and whatever was happening was all over the place. She told your Dad that things would regulate and become contractions and things would probably go quickly. It was so different this time. I wasn’t even sure what I was feeling. It wasn’t pain, just pressure and tightness and my waters had not broken like all the other times. Because of this I was convinced I was going to have a long drawn out early labour phase and even told people as much. Well wouldn’t you know, those were famous last words. Within minutes of telling people that, I was hit with contractions 4-6 minutes apart that were 45-60 seconds in length. They were in varying degrees of intensity so I finally knew I wasn’t going to make it to induction day and you had decided you were ready. It was actually perfect timing because it was early on Sunday and had lots of options for care. Phew. What a relief. This was 10:28am. The contractions continued and through each one I bounced on the ball and breathed and felt so much excitement that we were finally going to meet you soon. Everything felt so different this time. Dare I say it wasn’t near as painful as labour with your brothers. I could feel you moving around and I was aware of everything going on around me. O was curious and was sitting on the bed beside me and the ball when I got the first contraction that would have knocked me off my feet if I were standing. I instinctively put my head down on the bed, all while bouncing and I remember he laid down beside me and stroked my hair. It was the first indication things were picking up. It was 11:02am and it was then we decided to message Mommy’s friend to come over with the boys until JD could come by because I no longer wanted the boys climbing all over and poking me and I wanted your Dad to be able to focus on me if I needed him and not them. Then I got hit with another contraction that caused me to moan out and your Dad asked how I was and I told him we should get L over just in case. I had no idea if things were going to pick up or I’d be in the phase for a while but I wanted her there to help me (I knew the hip squeeze always made me feel better before) and to make sure I didn’t wait too long to go into the hospital. It certainly felt different labouring with my waters intact. It was missing an intensity I had with all your brothers so I wasn’t sure where I was in the process or what was going to happen. So he sent off a message and told her that he “didn’t want to deliver in the van”. Things ramped up quickly after those messages were sent. I was now breathing deeply and vocalizing through most contractions. I heard my friend come in but I was in the zone and didn’t move or lift my head off the bed and kept bouncing while waiting for the next contraction. Minutes later our Doula arrived in the middle of a contraction. It was 11:19am. I again was face down on the side of the bed bouncing on my ball and blowing raspberries and moaning when she came in. I felt her move beside me when I was hit with another contraction. 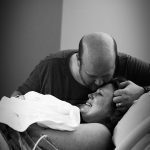 I felt her hand on my stomach as I breathed down through the contraction (I’m guessing she was trying to gauge the intensity of the contractions to see how hard my body was working) and I couldn’t believe at the speed the intensity was picking up. I know we were all worried that if my waters were to break you would be right behind them and I wouldn’t make it to the hospital, but my waters were intact and now the contractions were coming every 3 minutes and were 1+ minutes in length. I didn’t have much time to recoup between them before I was hit with another contraction. I knew it was getting close to go time. Every contraction I was getting closer and I couldn’t wait to meet you. L then asked me if I had any pressure with these contractions and I didn’t so I thought I probably had a ways to go and all was good. I didn’t know how much time passed when L told your Dad and I it was time to go. I now know it was 11:38am. At this point in past labours I was stubborn and questioned leaving in fear of being turned away or that I wasn’t ready but this time I didn’t. I was ready to bring you into this world. I waited for the contraction to pass and got up off the ball and I was off. No arguments from me this time. I made it to the front door before I was hit with another contraction. Luckily the wall and L was there or I may have dropped to the floor because of the intensity I was hit with. The contraction was then over and people started rounding up my shoes and bag and I remember telling L to never mind my shoes and for your Dad to grab them because I didn’t want to stop to slip them on and to open the van door NOW. I get to the van and the door wasn’t open and the doors were locked. I kept repeating: Open the van door. Open the van door. J OPEN THE VAN DOOR. I guess he couldn’t find his keys and for what felt like an eternity for me standing barefoot on the cold cement in a tank top, the van door opened and I crawled in just as I was hit with another contraction. Now your Dad was in the driver’s seat and L was behind me doing that hip squeeze I need so much during labour and we were backing out of the driveway. Wouldn’t you know it, it was Sunday morning so that meant the churches would soon be clearing out and that would impede our needed speedy ride to the hospital. Your Dad got past one church and they saw the cars lining up to get out at the second and L told him to speed up and go or we would be stuck on 13th Ave. forever. So we just beat the church rush and we were off and merging onto the highway. Not much further. But, I will tell you it feels like eternity. The car ride is the worst but at least we have the van so I could rock on all fours and breathe. I don’t know how far into the drive we were because I was just focused on the breathing and I kept my eyes closed and I vocalized and breathed through contractions when I suddenly whimpered to L “there’s that pressure you were asking about”. I knew you were coming like a bullet and so did everyone else in the van. I guess as we were merging onto the highway L said “La.ur.a has a very distinct smell right now, I’d drive as fast as you can” which means we were running out of time to make it to hospital and I was giving off the baby is right there ready to come out so our Dad better put pedal to the metal. I always joked I’d give birth in the van in the Kin Coulee dip but I did not want that to become a reality. Your Dad hit all green lights but one so that helped. With what felt like forever, but an instant all the same time, we were pulling up to the hospital. The drop off spots were full so your Dad pulled into the bus loading zone and ran to get me a wheelchair all while I was moaning and contracting. L was getting me out of the van when all of a sudden I was hit with a really strong contraction and I couldn’t breathe and I refused to move. They were trying to coax me into the wheelchair so I could contract while running through the hospital and get to L&D but I refused to move. I refused to sit down until it was over. I needed to lean into your Dad and breathe. Sitting is the absolute worst when you’re in labour. Running through the atrium and the elevator ride was a blur, I didn’t see or hear anything as I was focused on you and your speedy delivery. I couldn’t believe it was happening, and happening this fast. We finally get to L&D and I lean from the chair to press the button to open the doors to the wing and we were pretty much greeted by the nurses. I’m sure they heard me coming. It is the first time I saw other Moms in the assessment rooms as I barreled by groaning and breathing you down. I knew it wouldn’t be long until you made your earthside appearance. Nurse B & grad nurse K took us straight to L&D Room 70. They were scrambling to get things ready and needed me out of the chair and onto the bed to do a quick assessment. But I was having none of it, I kept asking “Where is J?”, “Is J here yet?” and I only agreed to get out of chair once your Dad was there from parking our van and making the sprint upstairs to us. I made sure to mention to L that I was going to want the gas again and she got them to set that up quickly for me. At 11:55AM it was determined I was 9.5cm dilated & 100% effaced with bulging membranes and K said something about a lip. I didn’t know what she was talking about so I asked L what was happening. She said that I’m “pretty much ready to go” but have a small lip left holding you in so if I would turn to the right we could get this show on the road. Contraction after contraction I breathed, moaned, and lost myself in the zone. I felt how close you were with each breath. 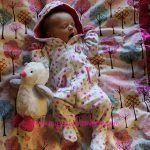 I asked L and your Dad a few times “why is this happening so fast?” because I was struggling to believe that a few hours previous I was up surfing facebook and now here I was in the throws of labour and on the brink of meeting my baby. It wasn’t long until my body started involuntarily pushing. The nurses needed to get my IV in for the Diabetic Protocol and she was struggling to get a vein. Trying to keep still and let her have my hand during these intense contractions was not easy and after what felt like eternity she got an IV placed. The on-call OB (Dr. P) still wasn’t there but they had the Dr. J from the regular maternity clinic on standby just in case but at 12:35pm Dr. P finally arrived and the room became a little more chaotic. That meant it was go time and you weren’t wasting any time. The first thing Dr. P said was he wanted me to roll to my back to finish pushing you out and I couldn’t understand why. I felt a small warm gush and I kept asking why and saying I pushed all my babies out on my side so why do I have to move? I never had to do that before and he even delivered one of your brothers. He claimed it was so my waters could be broken but he broke them already without my knowledge, but I did feel it I just didn’t know he did it and wasn’t thinking that’s what just happened. The nurses leaned in and pleaded with me to move and said something about me being Diabetic and having an increased risk for a big baby but I knew being on my back is not the answer to that and I have never had issues pushing my babies out either. However, I felt Dr. P was getting annoyed with my resistance and I’ll never forget his tone and hearing him say “because it’s easier for me” when trying to get me to go to my back. But you were right there and ready to go and I didn’t have time or the mind to keep questioning and I felt your Dad go to stand up and I could hear in his tone he wasn’t going to be too kind so I wrapped my arms around him and said “no don’t” and then I just rolled over and bared down. In the blink of an eye you were out. It was 12:42pm. You were placed on my stomach and pulled up to my chest. I welled up! You were here! You were a girl! I couldn’t believe it. You calmed instantly in my arms, pressed into my chest. I was in awe of how alert you were. I kept crying and saying “I have a baby girl. 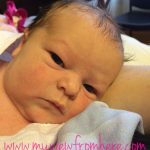 I can’t believe it is a girl….my beautiful girl is here.” One of the first things I noticed is that you had hair. So much hair (and it was dark!). You were so beautiful. After clearing up a small mix-up about placental issues I *didn’t* have with O, I cuddled you and delivered the placenta on my own and kept up the skin to skin. I kept raving about your eyes and how you seemed to be taking everything in. I was in awe in every piece of you. I kept staring back at you and examining the parts of you I could easily see and breathed you all in. I can’t remember what I was whispering to you but it was perfection. Every minute was indescribable. You latched and fed like a champ. Since everything went well you did not have to go to the NICU we took that time to give more cuddles and decided on your name and I couldn’t wait to introduce you to your 3 brothers. She looks like my Mom in this one.